Blogging -- Good, Bad, or Ugly? J. Robert Brown (Professor of Law, University of Denver Sturm College of Law) has recently posted on SSRN his article entitled Blogs, Law School Rankings, and the Race to the Bottom. Blogs are changing legal scholarship. Although not a substitute for the detailed, often intricately researched analysis contained in law reviews and other scholarly publications, they fill an important gap in the scholarly continuum. Blog posts can generate ideas and discussion that can be transformed into more a systematic and thorough paper or scholarly article. At the same time, blogs provide a forum for testing ideas once they are published in more traditional venues. While over time, a blog presence will likely become de rigueur for top scholars and law reviews, top tier schools as a group have not yet targeted blogs as a necessary component of scholarly activity. In the short term, therefore, blogs provide unique opportunities for faculty and law schools outside the top tier to enhance their reputational rankings. Blogs can enhance reputation by allowing faculty to route around some of the biases in law review placements and SSRN rankings that favor those at the top tier schools. Blogs also represent a cost effective mechanism for advertising scholarly activity. The paper discusses the evidence that blogs enhance reputation and surveys the way that scholars at law schools outside the top tier are already harnessing blogs to enhance their reputations. The paper also discusses what it takes to create a successful blog, from the search for content to the benefits of advertising. The paper finishes with a brief history of The Race to the Bottom, a corporate governance blog. This new volume of Restatement Third of Trusts covers trustee powers and duties. It also includes an updated version of the Prudent Investor Rule volume published by ALI in 1992. In the Restatement tradition, this volume combines clear black-letter provisions with extensive explanatory Comments, clarifying Illustrations, and detailed Reporter’s Notes. The volume is further enhanced by tables of cases and statutes, parallel tables showing corresponding Restatement Third and Restatement Second section numbers, a table of cross-references to the West Digest System and ALR annotations, and an index. The volume will be supplemented by an annual pocket part. Special thanks to Charles B. Thornton Professor of Law Brian Shannon (Texas Tech University) for bringing the publication of this volume to my attention. One of the most often expressed reasons for people failing to agree to become organ donors is the fear that death could be hastened to obtain the organs. In what is claimed to be the first such criminal case in the United States, Dr. Hootan Roozrokh of San Francisco was charged yesterday (July 30, 2007) by prosecutors in San Luis Obispo County for administering a harmful drug, excessive doses of morphine, and a sedative to Ruben Navarro to speed up his death so that his organs would be available for transplant. After suffering respiratory and cardiac arrest and irreversible brain damage, Ruben's family agreed to donate Ruben's organs. When Ruben was removed from life support, he continued to live instead of dying. It is at this point that Ruben's mother claims that he was given the lethal drugs causing Ruben's death a day later. The doctor's lawyer, however, claims that the charges are "unfounded and ill-advised" and are part of a "witch hunt." In addition, the coroner's office previously determined Ruben died of natural causes. See Doctor charged in transplant inquiry, USA Today, July 31, 2007. Dan Solove (George Washington) has updated his census of law professor bloggers (here and here). He notes that there are now 365 law professor bloggers (up from 309 in October 2006). The gender breakdown of the 365 law professor bloggers is 74% male and 26% female. 77 (21%) of the bloggers are part of [the] Law Professor Blogs Network. [This] network is more diverse than the general law prof blogosphere: 66% male and 34% female. The Board of Trustees of the Appalachian School of Law has appointed Clinton W. (“Wes”) Shinn as Dean and Chief Operating Officer of the Appalachian School of Law, effective July 1, 2007. Dean Shinn has been serving the School as interim Dean since December 12, 2006, while a search for a permanent dean was conducted. Professor Shinn practiced law in New Orleans, Louisiana for more than 25 years, concentrating in the areas of probate and estate planning, commercial transactions, oil and gas property interests, and environmental regulation. Professor Shinn returned to full-time academia in 1999, having previously taught for two years as an assistant professor of law at the Tulane University School of Law. From 1999 until 2001, he was a member of the ASL faculty, and then was an associate professor of law at the Mississippi College School of Law from 2001 until 2006. In August 2006, he returned to Appalachian as tenured Professor of Law. Wes Shinn is a graduate of the Tulane School of Law, where he graduated with highest honors, was elected to Order of the Coif, and served as Editor-in-Chief of the Tulane Law Review. He earned an LL.M. from the Harvard Law School in 1973. He teaches courses in Property, Secured Transactions, and Estates & Trusts at ASL. Dean Shinn has published in the legal fields of civil law obligations, secured transactions, and environmental law, and has been a frequent speaker in the areas of wills and estates. He is a Fellow of the American College of Trust and Estate Counsel, a Charter Fellow of the Louisiana Bar Foundation, and served a term as an elected delegate to the Louisiana State Bar Association. Special thanks to Prof. Paul Caron for bringing Prof. Shinn's appointment to my attention. I don't know the source of this picture but I thought it to be most interesting. 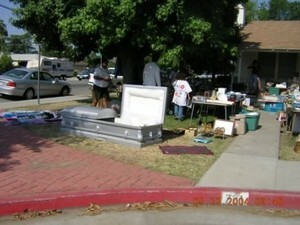 Would you buy a casket at a garage sale? 2 65 Why Limit Charity? I have returned from vacation. I hope you enjoyed the postings made by my research assistant, Elizabeth Storm, who, in addition to helping out with the Blog, was also in the midst of studying for and taking the Texas bar. As always, if you have any contributions, suggestions, or comments, please let me know. Christopher P. Cline (Holland & Knight, Portland, Oregon) has published his article, “The Fault, Dear Brutus, Is Not in Our Stars, But in Ourselves.” Some Thoughts on the Estate Planning Profession, in the Summer 2007 33 ACTEC J. 34 (2007). Our professional lives, never easy, seem to have gotten a lot more troublesome lately, leaving us with three options: just deal with it, quit practice, or find a new way to go about our work. The latter course, if taken with the client’s personal, rather than tax planning, needs as a signpost, has the potential to be the most satisfying. By helping the client with the hard question of how to leave a family or philanthropic legacy, the complexities described above, as well as others, become more manageable because they no longer are the primary focus of the lawyer-client relationship. And, paradoxically, we may find that the tax planning is more effective because it is now tied to goals that are important to the client. Joshua S. Rubenstein (Co-Managing Partner, Katten Muchin Rosenman LLP, New York, New York) has published his article, Standby Guardianship Legislation: At the Midway Point, in the Summer 2007 33 ACTEC J. 2 (2007). Standby guardianship legislation allows a parent or guardian who suffers from a progressively chronic or irreversibly fatal illness to ensure the current, effective appointment of a guardian of the person or property of his or her minor children to act sometime in the future during the lifetime of the parent without affecting existing parental rights. The primary motivation behind the introduction of such legislation has been the proliferation of degenerative, incurable diseases, such as HIV/AIDS, cancer, multiple sclerosis, and the muscular dystrophy, among individuals who have minor children. The need is particularly acute for single parents, typically women, who carry the childcare burden alone. Standby guardianship legislation permits parents to plan for their certain impeding disability, incapacity, or death, and each state should enact legislation to enable parents to do so.